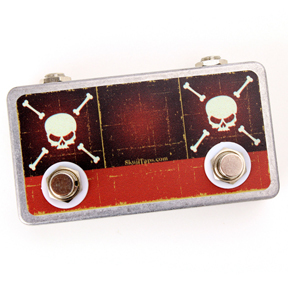 The Double Tap Controller Skull Tap has two dedicated momentary footswitches and output jacks. These switches are set to ‘Normal Close’ and is a perfect multi-controller pedal for a Boss RC Loop Station. Boss RC-3/RC-2 will allow you to stop the loop with a single click, clear a phrase and to change programs up and down. Boss RC-30 will allow you to select between track 1 and 2, turn on/off effects and change programs up and down. You will need a TRS cable to connect to the Loop Station. The enclosure is a sturdy aluminum enclosure. Components are high quality Switchcraft or Neutrik jacks. Everything is hand assembled and soldered.